The results from the November 6, 2012 election are in and on January 2, 2013, Jeff Roy will be sworn in as the next State Representative for the 10th Norfolk District. Roy secured 11,835 votes to win the 10th Norfolk seat over Rich Eustis who gathered 9,961 votes. You can view the Milford Daily News report on the election by clicking here. The Boston Globe report is available here. Precinct by precinct results for Franklin are available here. Seventeen thousand five hundred voters cast their ballots in Franklin for an approximately 85% turnout. In Medway, 5,213 voters cast ballots in this race. 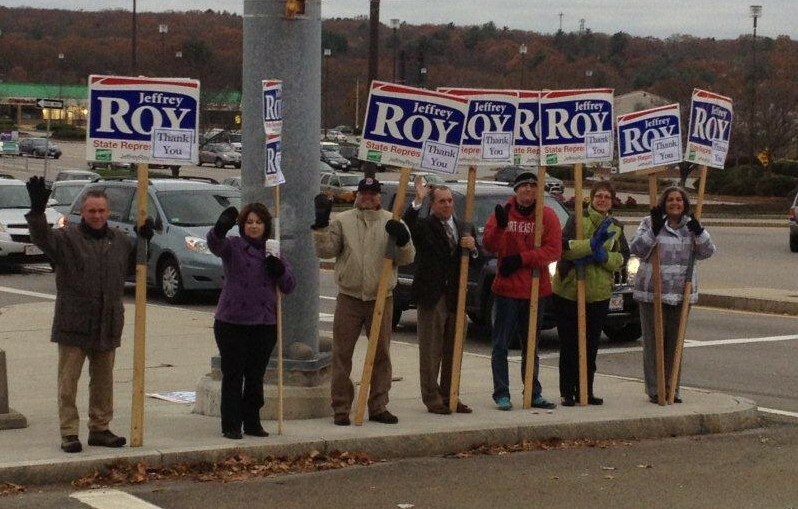 On Wednesday morning, Roy and several members of Team Roy gathered out in front of Franklin Village Plaza to thank morning commuters for their support. It was a bit nippy, but the team still had some adrenaline from Tuesday to keep them warm.